In the area of CRM alone of which Oracle is a top CRM provider by market share, the E-Business Suite offers over 50 CRM applications to handle sales force automation, sales order management, and channel management to name a few. Meanwhile, marketing applications include marketing automation, marketing resource management and tradeshow management, among others; while service applications include customer service, call center, field service, and self service. And that’s just the CRM module. The Oracle E-Business Suite is designed to help users manage the highly complex and technical processes of global business environments. Regardless if your business organization is small, medium, or large, the E-Business Suite can support multiple types of organizations from across every industry across the globe with Oracle’s 130,000 plus employees deployed in every continent and region. The E-Business Suite of enterprise-grade applications, together with Oracle’s well-known technical and customer support, can greatly help your sales, marketing, service, finance, human resources, production and operations department make informed decisions to increase performance, reduce cost, enhance customer experience, and drive profitability. While many applications in the Oracle line-up can be installed in your machine, the E-Business Suite is all about cloud technology which is leveraged to provide you one of the broadest and most integrated public cloud solutions. Powered by Oracle Cloud, applications in the E-Business Suite can be offered as best-in-class services across software as a service (SaaS), platform as a service (PaaS), and infrastructure as a service (IaaS). Through Oracle Cloud, you can even have the applications run in your own data center or have Oracle’s own data centers host them for you. Such flexible set ups help your business to pursue innovation, increase agility, improve efficiency, lower costs, and reduce the complexity of your IT environment. Oracle’s established international presence makes its E-Business Suite a truly global ERP platform. It is ideal for large multinationals since it has features that support a single instance global deployment. Deploy once and you’ve got the platform operating and connecting all the systems in the various departments of your offices and branches all over the world for a truly interconnected network of international operation that sources data and information from a central, consolidated database. You can synchronize operation planning, execution, supply and delivery on the global level. Of course, you may not need hundreds of applications in one package and may require only the most basic or essential solutions for your business’ needs. This is the advantage of Oracles cloud offerings in its various forms – SaaS, PaaS or IaaS – since it allows you to subscribe to certain applications software in the cloud as needed, such as accounting, HR, procurement, project management, service, sales management, marketing, and supply chain, among many others. Over 50,000 of Oracle’s total workforce are development engineers and customer support specialists dedicated to providing you answers to your queries regarding the applications, systems and services. Oracle provides essential support services including 24/7 technical assistance, proactive support resources, and product updates. Support also comes in over 2 dozen major world languages and in a variety of support channels – online, email, phone, tickets, documentations, tutorials, guide videos, or customer representative. Oracle delivers a fully-integrated support service. Since each company has unique business needs, it is prudent for them to desist from looking for a one-size-fits-all ideal software solution. Needless to say, it would be pointless to try to find such a system even among widely used software applications. The intelligent thing to do would be to list the various important factors that require consideration such as required features, finances, skill levels of employees, company size etc. Then, you should do your groundwork thoroughly. Read some Oracle E-Business Suite reviews and investigate each of the other solutions in your shortlist in detail. Such comprehensive groundwork can make certain you reject ill-fitting platforms and select the solution that offers all the features you require for business success. 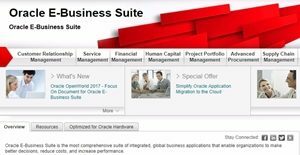 How Much Does Oracle E-Business Suite Cost? We realize that when you make a decision to buy ERP Software it’s important not only to see how experts evaluate it in their reviews, but also to find out if the real people and companies that buy it are actually satisfied with the product. That’s why we’ve created our behavior-based Customer Satisfaction Algorithm™ that gathers customer reviews, comments and Oracle E-Business Suite reviews across a wide range of social media sites. The data is then presented in an easy to digest form showing how many people had positive and negative experience with Oracle E-Business Suite. With that information at hand you should be equipped to make an informed buying decision that you won’t regret. What are Oracle E-Business Suite pricing details? What integrations are available for Oracle E-Business Suite? If you need more information about Oracle E-Business Suite or you simply have a question let us know what you need and we’ll forward your request directly to the vendor.